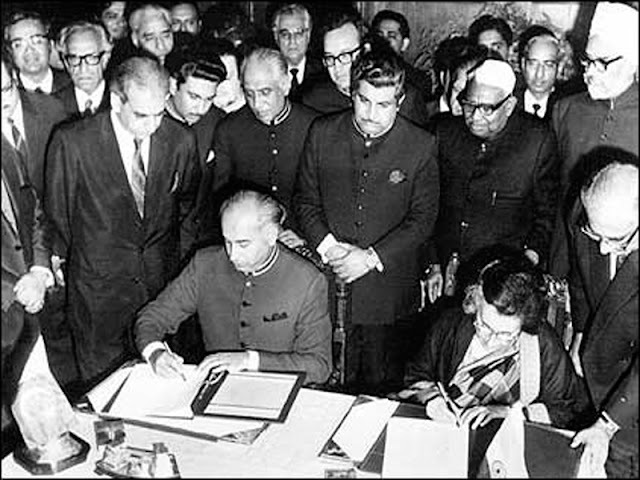 The Simla Agreement is a peace treaty that was signed by Indira Gandhi on behalf of India and Zulfaqir Ali Bhutto on behalf of the Pakistani side. It was signed following the Bangladesh Liberation War of 1971 on 2 July 1972 in Simla, the capital city of the Indian state of Himachal Pradesh. In this article we are going to have a look on this agreement in detail. After the 1971 war, this agreement was signed to put an end to the conflict between India and Pakistan and maintain good bilateral relations. Both the countries were required to settle their problems by peaceful means. The agreement converted the cease-fire line of 17 December 1971 into the Line of Control (LOC) between India and Pakistan and it was agreed that "neither side shall seek to alter it unilaterally, irrespective of mutual differences and legal interpretations". However, this was not respected and aggression continued on both sides. Operation Meghdoot happened in 1984 because of the Siachen conflict and Kargil War happened in 1999 even after the agreement. That the principles and purposes of the Charter of the United Nations shall govern the relations between the two countries. That in accordance with the Charter of the United Nations they will refrain from the threat or use of force against the territorial integrity or political independence of each other. Both Governments will take all steps within their power to prevent hostile propaganda directed against each other. Both countries will encourage the dissemination of such information as would promote the development of friendly relations between them. Steps shall be taken to resume communications, postal, telegraphic, sea, land including border posts, and air links including overflights. Appropriate steps shall be taken to promote travel facilities for the nationals of the other country. Trade and co-operation in economic and other agreed fields will be resumed as far as possible. Exchange in the fields of science and culture will be promoted. In this connection delegations from the two countires will meet from time to time to work out the necessary details. Indian and Pakistani forces shall be withdrawn to their side of the international border. In Jammu and Kashmir, the line of control resulting from the cease-fire of December 17, 1971 shall be respected by both sides without prejudice to the recognized position of either side. Neither side shall seek to alter it unilaterally, irrespective of mutual differences and legal interpretations. Both sides further undertake to refrain from the threat or the use of force in violation of this Line. The withdrawals shall commence upon entry into force of this Agreement and shall be completed within a period of 30 days thereof. This Agreement will be subject to ratification by both countries in accordance with their respective constitutional procedures, and will come into force with effect from the date on which the Instruments of Ratification are exchanged. Both Governments agree that their respective Heads will meet again at a mutually convenient time in the future and that, in the meanwhile, the representatives of the two sides will meet to discuss further the modalities and arrangements for the establishment of durable peace and normalization of relations, including the questions of repatriation of prisoners of war and civilian internees, a final settlement of Jammu and Kashmir and the resumption of diplomatic relations. Read the official document on Simla Agreement by the Ministry of External Affairs by clicking here. Even though this agreement looks good on paper, it is always under the radar of critiques. The biggest critic is that even after the signing of this agreement, Kashmir issue has not been solved and two major armed conflicts (1984 Siachen conflict and 1999 Kargil War) have taken place between India and Pakistan. Even though India won the war, India agreed to return the captured Pakistani land and Pakistani Prisoners Of War (POWs) back to Pakistan. This is said to be simply lack of strategic foresight by many critiques.